Bed bugs are tiny when they hatch, but each insect can grow to one-fourth of an inch in size as it matures. OXFORD, Miss. – It’s a fear for children that monsters reside under the bed. But those monsters could be living on the mattress or in the sheets. They’re called bed bugs. However, scientists with the National Center for Natural Products Research at the University of Mississippi School of Pharmacyare searching for a natural remedy to stop the insect from not only biting, but growing in rapid numbers. Funded through the U.S. Department of Agriculture and the U.S. Department of Defense, the Insect Management Program looks for a natural compound for management of pests affecting soldiers and the public. Finding that solution is easier said than done, as bed bugs are tough to control, much less eradicate. 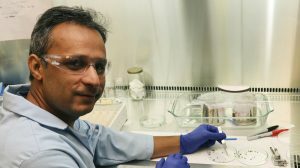 Junaid Rehman, research scientist in the NCNPR, works closely with two strains of bed bugs: those that are resistant to insecticides and those that haven’t been exposed to insecticides. Rehman is tasked with the challenge of sorting the tiny bed bugs, which grow to less than one-fourth of an inch in size, by age and making sure each gets its weekly fill of rabbit blood to help maintain the colonies. 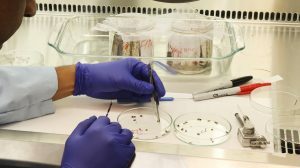 Researchers use three delivery methods to test the effectiveness of natural compounds on the bed bugs, Rehman said. The easiest ones to perform are fumigation and residual methods. In fumigation, the bugs are exposed to the vapor form for 24 hours, while the residual method has the treatment placed on filter paper and the insects are released over it. The toughest is a topical method, which involves Rehman knocking the insects unconscious with carbon dioxide before applying a drop of test article on each adult’s back. This process can take up to five hours with 50-60 bed bugs in each treatment for statistical significance. “In most cases of severe infestation, the only option to eradicate the insects is to discard the furniture,” Rehman said. “To avoid such an expensive operation, we are probing several methods for effective delivery of potential insecticides. Researchers work in a biosafety lab at the Thad Cochran Research Center where special precautions are taken to prevent the escape of any bugs. Though bed bugs are easily contained in the lab, that’s not the case in public areas. Bed bugs hiding in dark corners and crevices of hotel rooms or other spaces can survive as long as three months without food. The insect is not known to transfer diseases, but when an infestation is severe, the bites can cause health concerns. Finding a solution for this problem is at the forefront of the NCNPR’s goals. As Bed Bug Awareness Week (June 3-9) rolls on and as many people prepare to travel for summer vacations, Khan acknowledged that public awareness and preemptive measures help in bed bug cases. NCNPR researchers will continue working to make bed bug nightmares a thing of the past. “If we can come up with a natural compound that inhibits the bed bugs’ growth or alters its life cycle, and the natural compound has a safety profile needed for approval by the EPA as an insecticide, then we achieved our goals,” Chittiboyina said. This work is supported by the U.S. Department of Agriculture, Agricultural Research Service, under agreement no. 58-6066-6-043. Any opinions, findings, conclusion or recommendations expressed in this publication are those of the author(s) and do not necessarily reflect the view of the U.S. Department of Agriculture.